There’s a lot of excitement floating round academic communities for J.R.R. 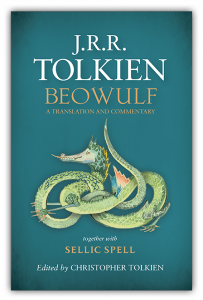 Tolkien’s forthcoming Beowulf translation (which you can pre-order here) where the prevailing buzz seems to be “best thing since slices bread”. Here, writer Mabel Slattery outlines why. EDIT: There is an error of fact within the article. Michael Drout did not actually re-discover Tolkien’s Beowulf translation. I did not “discover” the Beowulf translation, not even in the sense that I found it in the Bodleian Library. This claim is a conflation of a story about one manuscript with information about a totally different text. You can read Drout’s explanation in full here. Don’t forget to click the link to read the full article. I am not a Lord of the Rings fan. I tried. I promise you, I tried. I have given it ‘another go’ every year, and every time I just could not get past the dense prose style. And so I consigned myself to the hell of being the only student on an English degree who did not salivate at the mention of hobbits. But this does not mean I am not a Tolkien fan. Because Tolkien was not just the writer of books about hobbits and elves. He was also one of the greatest Old English/Anglo-Saxon scholars to have ever lived. As a philologist (an expert on language), he understood language on a much deeper level than many of us could ever hope to. And that is why I think the publishing of his translation of and commentary on the great English epic Beowulf on 22 May is one of the best things to happen to literature in practically forever. Translating Old English poetry is…. Well, I just did it in an exam a couple of weeks ago and I can say with confidence that it is one of the hardest things I have ever done in my life. Old English is a mental language; at times it bears a resemblance to Modern English (so hwī is why, freond is friend, and so on), but some of it is completely mad (orc-neas is, at the best guess I can make, “demon-corpses” – which not only gives you an insight into some of Tolkien’s inspiration, but also makes you worry about the Orkney Isles…). In poetry it is even crazier because about two-thirds of the words are implied – Old English is brilliantly expressive so that is fine, but reading it through a modern lens is really difficult. If your Old English is good and you are feeling very very brave, you can actually view the only surviving manuscript of Beowulf online at the British Library website here. But if you just want to read a great story of adventure with lots and lots of fighting, then a good translation is what you want.